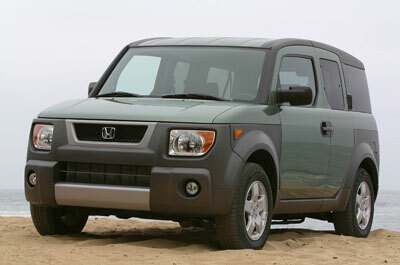 San Francisco: The Honda Element is the only SUV of its kind. This unique vehicle combines a relatively modest length with huge carrying capacity, mini-Hummer looks, limousine-length rear seating, and some eye-popping colors for some motoring fun with a practical streak. The 2006 models are carried over pretty much from the 2005’s. The Element is still based on Honda’s mainstream CR-V small SUV, so it rides like a car, even if it looks like a truck. You still get urethane rinse-out mats instead of carpeting, rear seats that fold up or remove entirely, and an upright windshield for the command of the road feeling of driving an SUV. With the Real Time four-wheel-drive option, you can hit the trail too. Until this year, all Elements featured gray plastic lower body panels for a tough, utilitarian look. The new EX-P model, however, debuts painted panels in their place, which give the Element a more unified, sharp appearance. My Alabaster Silver Metallic test car glistened like a precious gem in my driveway when I wasn’t zipping around town in it. You can get Tango Red Pearl and Tangerine Metallic exclusively on the EX-P model. The Element is a four-door, but the rear doors are hinged at the back like suicide doors. After you open the front door, you pull a handle mounted in the leading edge of the rear door to open it. The doors work like a double gate, with no center post, so you can swing both sets open to load almost anything onto the wide, flat floor from either side. The Element’s seats are covered in FXC Fabric, For eXtreme Conditions, which along with the waterproof floors, makes the Element seem impervious to damage. The dash panel and doors are beefy looking and contain lots of handy storage niches. In my tester, a contrasting blue band across the dash gave it some extra distinction. Large, round silvery gauges are filled with the information you need. For 2006, Elements come in LX, EX, and the new EX-P models. The EX and EX-P enjoy 12-volt accessory outlets, overhead storage compartment, a driver’s armrest, remote entry, sunvisor mirrors, alloy wheels, and a 270-watt AM/FM/CD with seven speakers, including a subwoofer. You even get MP3 capability and a digital Media auxiliary jack. I was especially impressed by the seatback bungee loops and the power up & down windows for the driver. In all three trim levels, you can choose a manual or automatic transmission, and two- or all-wheel-drive. All-wheel-drive models get a spacious glass sunroof over the rear seat, which is positioned surprisingly far back in the vehicle. The Element comes with only one engine, the 2.4-liter 156 horsepower transverse four-cylinder. It has enough muscle in most driving conditions, although with a weight of 3,300 to 3,500 pounds, it can be a little slow on long climbs. Mileage is 21 City, 24 Highway, which is about right for its size and blockiness moving through the air. For safety, every Element gets four-wheel disc brakes with antilock and electronic brake distribution. In case you do run into something, the Element protects you with dual-stage, dual-threshold front airbags, as well as side airbags, up front. The passenger side airbag system can detect if there’s an occupant, and won’t activate in a crash if a child is sitting there (or if the chair is empty). The government crash tests give the element top five-star ratings. I have a couple of little issues with the Element. The wide-opening doors can be hard to enter and exit from when you’re parked close to another car. I also noticed some tendency of the car to be pushed around by strong winds so it must be that barn-like coefficient of drag. An EX-P model like my test unit, with Real Time four-wheel-drive and automatic transmission, comes to about $24,000. At the bottom of the menu, the two-wheel-drive LX with a manual gearbox starts at $19,495, including destination charges.